Airlines across the world have begun requiring two crew members to always be present in the cockpit, in the wake of the French Alps crash. A number of major Canadian, Norwegian, German and UK airlines have all pledged to change their policies. The UK's Civil Aviation Authority (CAA) said it will "monitor the situation" as the crash investigation develops. 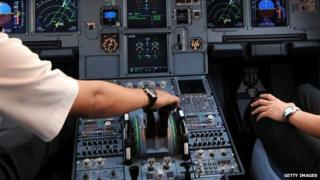 Lufthansa said that no matter how good the security, ultimately nothing could stop a rogue pilot. Air Canada, Westjet and charter airline Air Transat, Norwegian Air Shuttle, major German airlines including Lufthansa and Air Berlin, Easyjet, Monarch Airlines, Virgin and Thomas Cook have all confirmed they are changing their safety policies. The change comes after UK airlines were told to review procedures following Tuesday's Alps crash in which 150 people died. The new procedures will mean that two crew members must always be present on the flight deck. The changes come after it emerged the co-pilot of Germanwings Flight 9525 had apparently locked himself in the cockpit before crashing the plane into the mountains below. Monarch Airlines have introduced the new procedure with immediate effect. Chief Operations Officer, Nils Christy said: "The revised protocol is now mandatory for all Monarch passenger flights. In addition to this change, we will continue to carry out our "eyes-on" checks where cabin crew regularly enter the flight deck during the cruising phase of the flight to check on the Pilot and the First Officer. " Budget airline Easyjet has said it will require two crew members to be in the cockpit of its aircraft at all times from Friday, 27 March. Canada's government have issued an immediate order requiring two crew members to be in the flight deck at all times. Transport Minister Lisa Raitt said the government is "reviewing all policies and procedures" and is "watching the situation in Europe closely". German Aviation Association, representing Germany's biggest airlines, including Lufthansa and Air Berlin, say they plan similar rules. Spokeswoman Christine Kolmar said the plan will be presented to German aviation authorities on Friday and the airlines will implement it "as soon as possible." A Virgin spokeswoman said: "We always ensure we have the highest safety standards and, while it is our common practice to have two members of our crew in the flight deck at all times, in light of recent events we are now in the process of formalising this to be policy. " And a Thomas Cook spokesman said: "We are adapting our procedures to ensure there will always be two people in the cockpit." In a Twitter exchange Monarch Air confirmed its policy already states that a member of cabin crew must stand in when it is necessary for the pilot or first officer to leave the flight deck. The CAA said it has told all UK operators to review procedures. All UK airline pilots undergo extensive and regular medical assessments to determine their fitness to hold a licence, it said. Examiners are required to assess a commercial pilot's mental health at each medical examination. Marseille prosecutor Brice Robin said earlier the co-pilot, named as Andreas Lubitz, was alone in the cockpit of the Germanwings plane when it crashed in the French Alps. The co-pilot intentionally started a descent while the pilot was locked out, he said. Mr Robin, citing information from the "black box" voice recorder said there was "absolute silence in the cockpit" as the pilot fought to re-enter it. The Airbus 320 from Barcelona to Dusseldorf hit a mountain, killing all 144 passengers and six crew, after an eight-minute descent. Among those killed were Britons Paul Bramley, 28, from Hull, and Martyn Matthews, 50, from Wolverhampton. Seven-month-old Julian Pracz-Bandres and his Spanish-born mother Marina Bandres Lopez-Belio, from Manchester, also lost their lives, the Foreign Office said on Wednesday. The second "black box" - that records flight data - has still not been found as a massive recovery operation continues. The British Air Accidents Investigation Branch (AAIB) confirmed it has a "black box" expert working with French investigators who has been there since Wednesday.